View the square by 3 numbers at the time. Pair them by opposites. Also, any three numbers that cross the center is its own opposite number. Their sum is always 1,110. Example, 492 + 618 = 1,110. Or, 951 + 159 = 1,110. The center becomes 555. The four sides of the perimeter total 2,220. View the square 2 numbers at the time by opposites. Any two numbers that crosses the center are paired in the same row. The sum is always 110. Thus, 49 + 61 = 110. Or, 35 + 75 = 110. The 110 can be pulled out of the square in 16 ways. Thus, 16 X 110 = 1,760. The center then becomes 55. It is surrounded by 440. 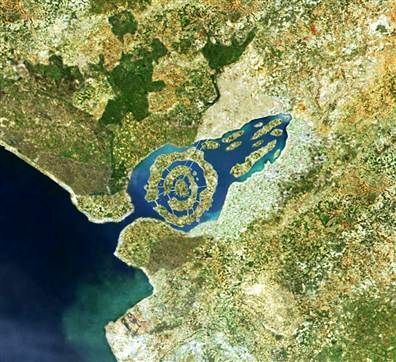 The Atlantean picture of 3 concentric rings of land and water. They represent the center-perimeter on three levels of the square of Saturn (3 x 3). Saturn was a king in Atlantis. 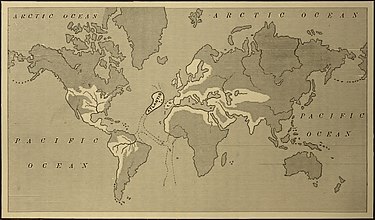 Atlantis was allegedly located between Africa and America. A map showing the supposed extent of the Atlantean Empire. From Ignatius L. Donnelly‘s Atlantis: the Antediluvian World, 1882. Another demonstration of the square and Atlantis involves the Titans. There were 18 of them as opposed to 27 other children. Both totals demonstrate properties of the 3 x 3 number square. Let’s play tick-tack-toe: The length or width of the square is the length of 3 boxes. The diagonal becomes 1,412…. times longer than the length of any of the square’s sides. The length of the diagonal of a square is expressed by √2 x the length of a side. In this case, √2 x 3 = 4.24264…It just so happens that 4.24264…when squared equals 18. We have the 18 Titans. I’ve also blogged about how 18, and the entire number square structures the periodic chart. In the case of the present blog, it shows Atlantean mastery of the 3 x 3 square. So Where are the other Atlantean 27 Children, You Ask? The 3 x 3 magic square has three manifestations primarily used by the ancients. They are by ones, tens and hundreds. It takes three tick-tack-toe boards to define this characteristic. Thus 3 x 9 (boxes per manifestation) = 27. Watch for more blogs on Atlantis. Since this is my 250th blog, I felt it had to be special. Enjoy!